So first of all, I have to come clean about something. You may be wondering what a guy like me (one who tries to shop relatively seasonally) is doing with fresh peppers and tomatoes in February...sorry, I had a momentary desire for warmer months and sought it through food...it's about this time of the year that the constant snow and grey begins to get to me. Thus said, you can use canned diced tomatoes for this, which I have in the past. 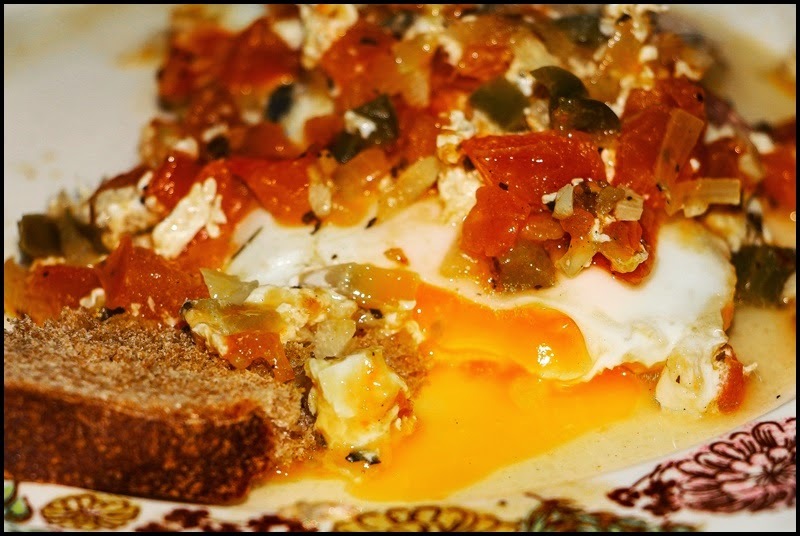 Shakshouka is a Mediterranean egg dish that is simple to make, nutritious, and really delicious. There are no hard and fast rules for the recipe other than it usually contains tomatoes and peppers, but one can also add other things they like, such as potatoes or beans (just to name a few). The sauce itself can be a sort of salsa-y type sauce, such as this recipe, or it can be more of a smooth tomato sauce (such as this recipe which I posted last year). It can be either cooked entirely on the stove-top (such as the recipe posted here) or it can be finished in the oven (as with this previous recipe). It is a recipe that is suitable for breakfast, lunch or dinner. By now you likely get the picture...it's really up to you how you want to make this and in fact eat it. Anyhow, the recipe which I made today, and the one pictured, is below. heat the olive oil in a heavy skillet over medium high heat. Add the onion and bell pepper; saute for a few minutes, then add the jalapeno and garlic. 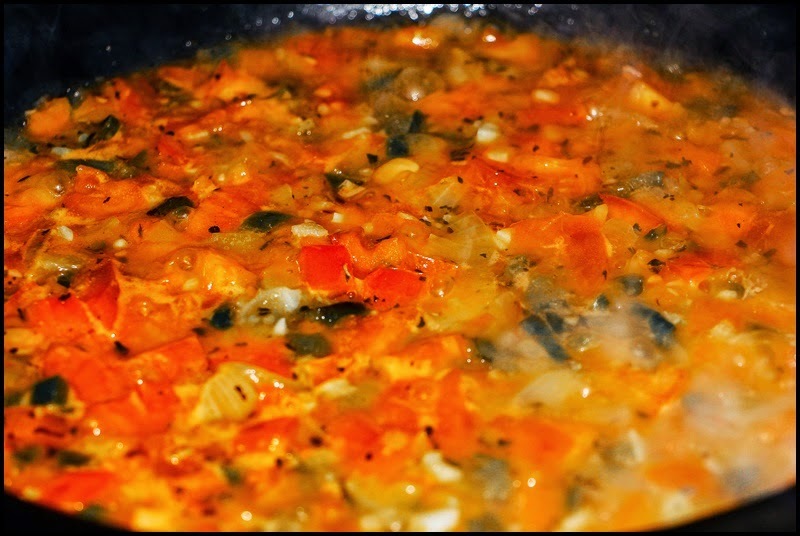 Cook for a few minutes longer, until the vegetables begin to brown slightly, then add the oregano, cumin, and salt; stir for a just a minute to release the flavor of the seasonings, then add the tomatoes and water. Bring the liquid to a boil then lower it to a simmer. Cook the sauce for about five minutes, or until it reduces and becomes somewhat thick. Lower the heat to a very slow simmer, then crack the eggs into the sauce. 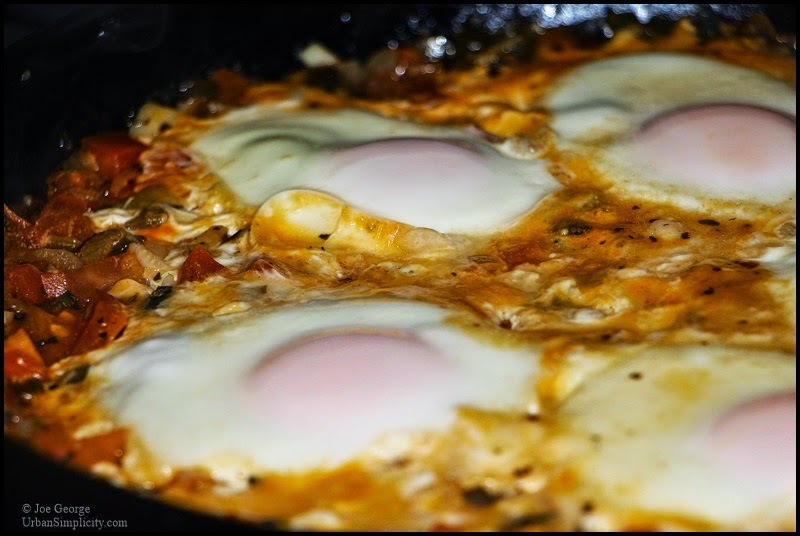 Cover the skillet with a lid and cook the eggs for about 5 minutes, or until they are cooked to your liking. Serve with crusty bread.